Sometimes they go even better and that's just what happened today. Today was a special day for a sweet friend of mine. A few years ago on this day her Mom took her first breath in Heaven. 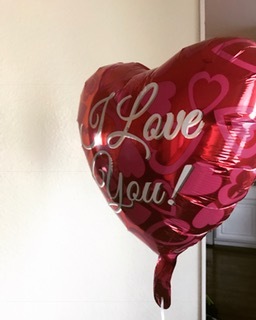 I bought the balloon and planned on releasing it and sending her a picture. My morning didn't go as planned and suddenly by lunch time I realized we hadn't released the balloon. I decided we should just make a day out of it. I was going to take this small balloon and piece of her Moms memory around with me for the day. We took my son to school, went to the store, came back to my house and picked my son up.